Bride Lyndsey French wanted to make sure the guests at her wedding had something tasty to eat – so she baked 100 cupcakes, decorated them and created a beautiful display at their Farington Lodge reception. Kenny Gawne and Lyndsey French. Piano teacher Lyndsey met telecoms manager Kenny Gawne while they both worked at Elite Telecom, before Lyndsey followed her passion to teach music. The Bamber Bridge couple became engaged while on holiday in Naples. Lyndsey, 28, said: “It was very romantic. 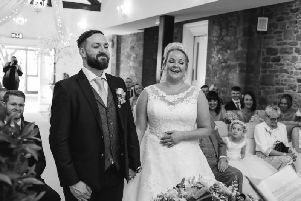 The couple married at Valley Church in Bamber Bridge, a special church to them where they both attend. Lyndsey’s brother Andy French played the saxophone in the church with his two friends – music he had composed for Lyndsey and her dad to walk down the aisle. They were driven in style in a beautiful white Porsche and were treated to champagne on the journey from the church. The couple are both vegan and organised a vegan menu for the day. Lyndsey added: “The chef at Farington Lodge rose to the challenge of providing a lovely three-course vegan meal to our 74 guests. “Lots of people told us they were surprised how much they enjoyed the food. “Even our wedding favours were all vegan. “They were millionaire shortbread, chocolate brownie pieces and rocky road squares. 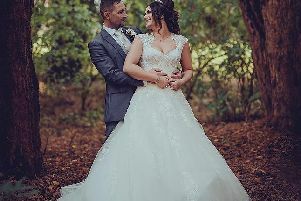 “Farington Lodge was such a great choice for our reception venue they really looked after us and our guests. “I can’t stop smiling when I think about our big day. “Our friends and family all came together and it was perfect to spend the day with everyone we cared about.